It's beautifully sleek, versatile, and can even heat up your home. These are just a few of the reasons the Touchstone Onyx Wall Hanging Electric Fireplace is one of the best purchases you can make right now. Plus, it's surprisingly affordable, so you don't have to go into debt to get the beautiful electric fireplace you crave! This wall-mounted electric fireplace from Touchstone measures 50” x 21”, and it weighs just 46 pounds. It's easy to mount on any wall—the manufacturer claims you can even do it by yourself. What’s unique about this beautiful modern electric fireplace is you can choose between faux logs or crystals for the interior (both are included), depending on which aesthetic you prefer. Further, the fireplace has two heat settings, high and low, that can warm a room up to 400 square feet. Reviewers describe the Touchstone Onyx Wall Hanging Electric Fireplace as stunning, mesmerizing, and realistic. Many say that it is easy to install and adds an undeniable touch of elegance to any room. Plus, you can’t beat the reasonable price for this high-quality product! Most electric fireplaces cost at least $100, but if you're looking for a small, budget-friendly option, the BestMassage 35" Electric Fireplace is perfect for you. This affordable electric fireplace can either be wall-mounted or used standing, and it even can help heat up a small room. The BestMassage electric fireplace measures 35” x 20” tall. It features a curved glass front with realistic 3D flames that add instant ambiance to any room. The fireplace comes with a remote control, so you can easily turn it on and off, and it also includes a wall mounting bracket and stand base. There are two heat settings—high and low—which allow you to warm up your room, as well. According to reviewers, you really can't beat the price on this small electric fireplace. It's hundreds of dollars cheaper than many other options, and many say the realistic flames are quite beautiful. Plus, it’s an efficient way to heat up a room on a chilly day. If you already have a standard fireplace but want to convert it into an electric fireplace, you need an electric fireplace insert such as the Best Choice 28.5". This energy-saving product is easy to install, and it will provide both ambiance and warmth in your home. Do you love the look of a fireplace mantel but don't have one in your home? You can get a truly realistic electric fireplace, complete with mantel, thanks to the Real Flame Silverton Electric Fireplace. This unique freestanding product comes with a stunning wooden mantel that will add instant elegance to any living space. The Real Flame Silverton Electric Fireplace is 48” x 41” x 13” deep. The product includes a wooden mantel, firebox, screen, and remote control, and it is available in white, dark mahogany, and black finishes to match any interior. Like any electric fireplace, this product plugs into a standard outlet, making set up a breeze, and it also includes a remote control, programmable thermostat, timer, and various brightness settings. Plus, it can be used to heat rooms of significant size. This product received top marks from reviewers, who say it's easy to assemble and looks simply beautiful. While the price is a bit higher than other electric fireplaces, many people write that it’s worth the extra money for this high-quality product. For an easy way to integrate an electric fireplace into your home, you may want to consider one that's built into a TV stand. 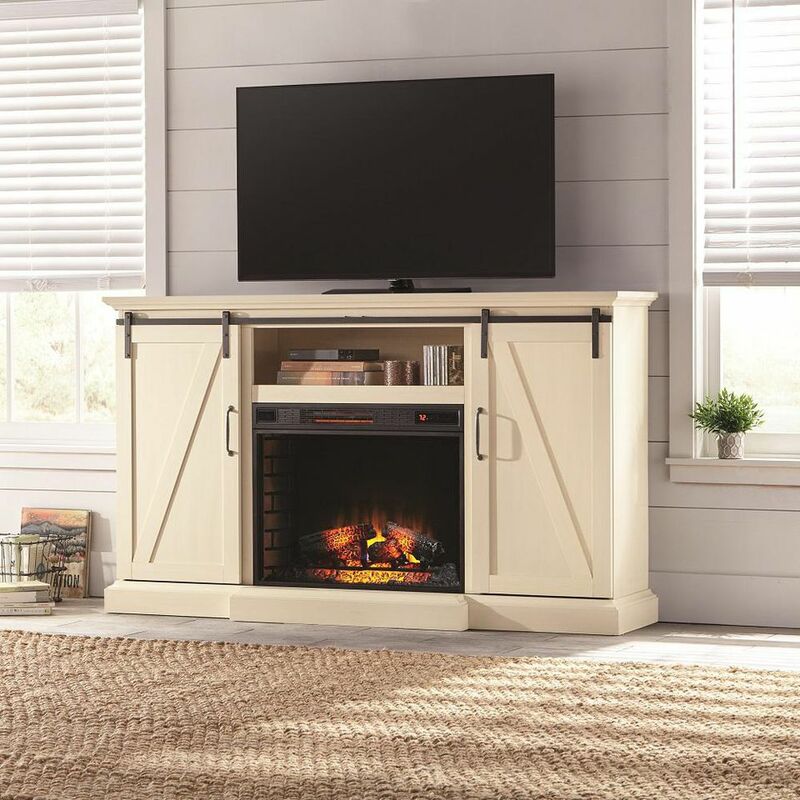 For instance, the Home Decorators Collection Chestnut Hill TV Stand Electric Fireplace is a top-rated product that provides both the cozy ambiance of a fireplace with the functionality of a spacious TV console. Once assembled, this TV stand measures 68” x 40” x 17” deep, and it can support a TV up to 80”. The chic media console comes in several finishes to match your decor and features sliding barn doors, as well as several shelves inside cabinets where you can store various media components, such as cable boxes, gaming systems, and more. When you slide open the doors, there is a 28” infrared quartz electric fireplace, which can provide supplemental heat for up to 1,000 square feet. You can choose from six different flame effects, and there's even an electronic timer function for automated shut-off. Perhaps the most compelling part about this TV stand with a built-in electric fireplace is the glowing reviews. People say that while it takes a while to assemble, the finished product looks incredibly high-end and is worth the price. If you're looking for an electric fireplace that provides an impressive amount of supplemental warmth, one of the best options is the Pleasant Hearth Sheridan Mobile Infrared Fireplace. Don't be fooled by its unassuming appearance—this electric fireplace can give off an impressive amount of heat, warming rooms of up to 1,000 square feet. The Pleasant Hearth Fireplace measures almost 32” x 27” x 13” deep, and there are four finishes for you to choose from. The product comes fully assembled, so all you have to do is plug it in! you can choose from three levels of flame brightness and an impressive five levels of heat, which can warm surprisingly large rooms. Reviewers say they’re impressed with the realistic flames in this unit, as well as the amount of heat it puts off. While this product may be simpler than other electric fireplaces available, it’s unbeatable in terms of price and performance. Many electric fireplaces are designed to be recessed into walls, but if you're looking for a freestanding unit, you should definitely consider the Duraflame Infrared Quartz Fireplace Stove, which has the look and feel of a wood-burning stove. This freestanding electric fireplace is 24” x 23” tall x 13”. The durable body is made out of metal and features a beveled glass door, as well as glass side windows, so you can view the fire from all angles. You can choose from five adjustable color, brightness, and speed settings for the 3D flames, and the unit can even provide supplemental heat for spaces up to 1,000 square feet. Some highlights of the positive reviews on this product include that the flames are incredibly realistic, the unit is safe for pets and children because it doesn't get hot, and that it can provide an impressive amount of supplemental heat. The Duraflame Infrared Quartz Fireplace Stove has hundreds of positive reviews, and many people say they’d buy this product again in a heartbeat. If you're looking for an affordable, highly-rated wall-mounted electric fireplace, look no further than the AKDY Wall Mount Electric Fireplace Heater. While on the smaller size, this electric fireplace heater gets top marks from reviewers and is significantly less expensive than many comparable products, making it a smart buy for any homeowner. This wall-mounted unit measures in at 35” x 22” x 4”. It’s designed to hang on the wall, and it features a beautiful tempered glass front with realistic flames. You can choose between logs and pebbles for the interior, and there’s even multi-colored LED backlighting to help set the mood in your home. Plus, the AKDY Wall Mount Electric Fireplace Heater can also be used to heat rooms of 400 square feet with its two heating levels. Reviewers love how many options this wall-mounted electric fireplace has, and the majority agree it’s easy to install and beautiful to look at. Several also note that it’s relatively quiet compared to other electric fireplaces, which is an added bonus.